The growing threat of national security due to rise in number of illegal migration, is one of the primary drivers aiding to the growth of the global military biometrics market. The increase in the number of illegal migration affects the growth in economy as the people residing illegally are not liable to pay any form of taxes to the government. This is one of the primary concerns for restricting illegal migrations. Furthermore, another issue that can be linked with illegal migration is the fear of terrorism. According to the U.S. department of defense, 30,000 illegal migrations were reported in 2015 which belonged from countries linked with terrorist activities. The use of biometric authentication helps in identifying individuals entering the country. Hence the demand for biometrics in defense applications is expected to grow significantly during the forecast period. The global market for military biometrics accounted for US$ 5,650.5 mn in 2016. The market is expected to grow steadily at a CAGR of 7.4% from 2017 to 2025, to reach US$ 10,620.6 mn. By geography, the global military biometrics market has been segmented into North America, Europe, Asia Pacific, Middle East & Africa and Latin America. North America and Europe together held more than 55% of the global market in 2016 and expected to remain dominant during the forecast period. North America has been anticipated to be the largest market in global military biometrics market. The growing concern for illegal migration in the U.S. is expected to drive the demand for military biometrics in this region. Asia Pacific held the second largest market for military biometrics. The region has also been analyzed to be the fastest growing owing to the presence of developing nations such as India and China who are increasingly adopting the biometric authentication in defense to upgrade their security measures. Europe held the third largest market during the forecast period. The leading countries in Europe include Germany, France and the U.K. who are focusing on upgrading their defense capabilities by upgrading their authentication systems. Furthermore, the countries are also trying to restrict the entry of illegal migrations from under developed nations. Middle East and Africa region is also expected to witness steady demand for military biometrics owing to the presence of countries such as Saudi Arabia and U.A.E. which invest significantly to upgrade their defense and security. Furthermore, this region also includes countries like Iraq and Syria which are witnessing constant terrorist activities. Latin America holds the smallest market share and is expected to witness sluggish growth owing to the weak economic conditions of the countries present in this region. The global military biometrics market has been segmented by types in fingerprint recognition, facial recognition and iris recognition among others. The fingerprint recognition segment has been analyzed to be the largest market during the forecast period. The fingerprint recognition is most commonly used authentication system in most of the defense agencies across the globe. However, the accuracy of iris recognition is expected to drive the demand for this segment strongly in future. Furthermore, facial recognition is also witnessing steady growth due to their wide use in border security and surveillance. 3M Cogent, Inc. (United States), Crossmatch (United States), M2SYS Technology (United States), NEC Corporation (Japan), Safran Identity and Security (France), Aware, Inc. ( United States), BIO-Key International, Inc. (United States), Fulcrum Biometrics LLC (United States) and HID Global Corporation (United States) among others are some of the major players in global military biometrics market. However, there is one major factor lowering the demand for these systems during the forecast period. The installation of biometric authentication systems is complex and needs skilled personnel. In case of a system breach, there is a chance of data loss. Moreover, the whole system installation cannot be reset easily. This is one primary reason hindering the demand for biometric systems in defense sector as it involves the security of highly confidential data which cannot be compromised. Nevertheless, the ongoing technological innovations are expected to reduce the chances of breaching or hacking biometric authentication systems. Furthermore, the ongoing research and development in the field of secure access in expected to drive the demand for biometrics in defense. In June 2016, the CIO of Pentagon, Terry Halvorsen announced a two year plan of replacing the functions of common access cards with biometric systems such as iris scanners and behavioral analytics. The same technology will further be incorporated by the U.S. allies who include Australia, Britain, Canada and New Zealand. The global military biometrics market can be segmented by types in fingerprint recognition, facial recognition and iris recognition primarily. The fingerprint recognition market is expected to dominate the market during the forecast period owing to the increasing application of these systems in developing regions such as Asia Pacific and Middle East. Furthermore, the iris recognition segment has been identified to be the most attractive segment owing to its accuracy in identifying the person with less malfunctionality. Iris recognition has been analyzed to be the most accurate way of identifying a person. Moreover, iris cannot be copied or used from a dead person as it becomes useless immediately. In addition, facial recognition is also becoming popular as it can be used to track a person in any area equipped with facial recognition cameras. Hence the demand for facial biometrics is expected to drive the market for military biometrics significantly. Hence the segment is expected to witness promising growth during the forecast period. Moreover, the growing concern over security from terrorist activities and the global rise in mass migration with illegal identities is expected to drive the global demand for facial and iris biometrics significantly. By geography, the global biometric market has been segmented into North America, Europe, Asia Pacific, Middle East & Africa and Latin America. North America has been analyzed to dominate the military biometrics market. The ongoing threat of illegal migrations from Mexico has resulted into the U.S. government upgrading their authentication systems in border security. Furthermore, Asia Pacific has been anticipated to have the fastest growth during the forecast period. Countries such India and China are gradually investing towards upgrading defense facilities with secured authentication which is expected to drive the market for military biometrics significantly. 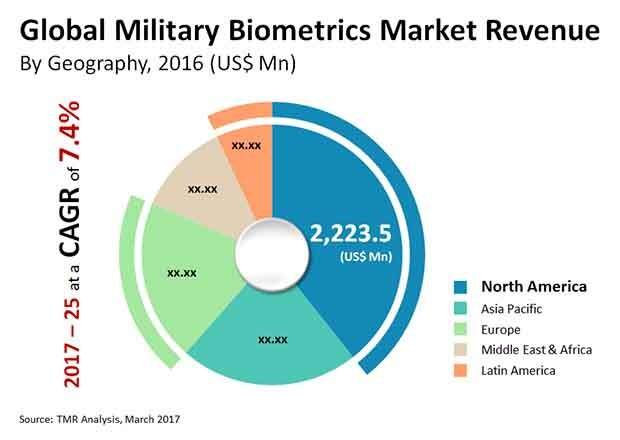 The major vendors in the global Military Biometrics market are 3M Cogent, Inc. (United States), Crossmatch (United States), M2SYS Technology (United States), NEC Corporation (Japan), Safran Identity and Security (France), Aware, Inc. ( United States), BIO-Key International, Inc. (United States), Fulcrum Biometrics LLC (United States) and HID Global Corporation (United States) among others.